For the 4th year in a row BTC proudly sponsors the contest “Encourage Friendship” in the scope of the Mission: Social Responsibility • BTC d.d. 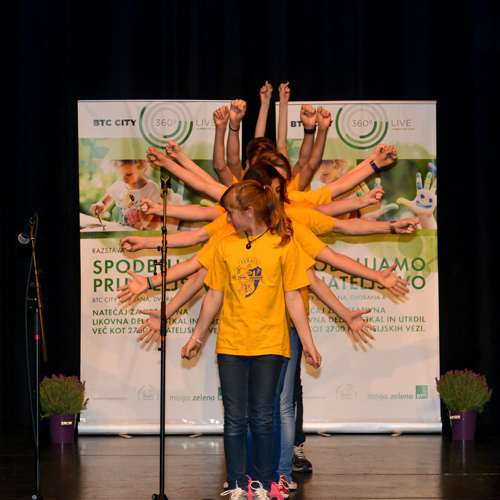 on 20th May 2016 at 10 a. m. at the Festival Co-Existence (“Sobivanje”) in BTC City Ljubljana, the winners of the contest will be announced and awards will be given to all the participants from the Central Slovenia, Primorska, Gorenjska and Zasavje regions. The organisers of the event will award project mentors and coordinators with certificates of their participation and contest realisation, while all the participants will receive special awards. The contest and exhibition will be made possible by the BTC Company with its strategic project Mission: Green which emphasises a socially responsible relationship towards the environment. The project combines different areas – environment protection, science, education, health services, sport, culture, and humanitarian activities. Apart from that, it also includes investments towards establishing a greener way of life in our capital. All projects of the BTC Company are realised in cooperation with its partners, thus the Company’s support of the project Encourage Friendship in 2016 is not accidental.